The Ambassador of Algeria to India Mr. Hamza Yahia Cherif called on the Minister of State (I/C) for Petroleum and Natural Gas Shri Dharmendra Pradhan today. Both sides agreed to deepen cooperation between the two countries in the field of oil and gas. The Mayor, Houston, Texas Ms. Anne D. Parker called on the Minister of State (I/C) for Petroleum and Natural Gas Shri Dharmendra Pradhan today. 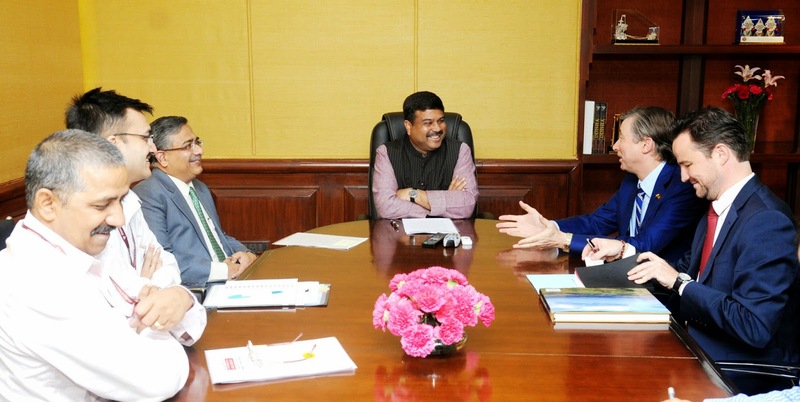 Both sides discussed mutual cooperation in the field of Hydrocarbon exploration & production sector. It was also discussed that the companies from both the sides should explore avenues of cooperation in the field of Research and Development. As per the recently issued guidelines of the Department of Economic Affairs for utilization of Nirbhaya Fund, the Union Ministry of Women and Child Development has been assigned as the nodal Ministry to appraise the scheme to decide their suitability to qualify for getting funds from the Nirbhaya Fund and to review and monitor the progress of Schemes sanctioned under the Nirbhaya Fund. After being assigned as nodal Ministry to appraise the schemes, the Ministry of Women and Child Development has not received any proposal from State/UTs including Delhi. A total amount of Rs.3,000 crore has been allocated to Nirbhaya Fund in the year 2013-2014, 2014-15 and 2015-16. Out of Nirbhaya Fund, a proposal of Ministry of Road Transport & Highways on “Security for women in Public Road Transport in the Country” with the estimated cost of Rs. 1405 cr and a proposal of Ministry of Home Affairs for establishing an emergency response system to attend women in distress with the estimated cost of Rs. 321.69 crore had been approved by the Cabinet Committee on Economic Affairs on 2nd January, 2014 and 4th February, 2014 respectively. An amount of Rs. 150 crore and Rs. 50 crore were provided to Ministry of Home Affairs and Ministry of Road Transport and Highways respectively for their sanctioned projects during the year 2014-15. Apart from this, recently two schemes of Ministry of Women and Child Development i.e One Stop Centre for Women affected by violence with a total project cost of Rs. 18.58 crore and Scheme for Universalisation of Women Helpline with a total project cost Rs. 69.49 crore have also been approved to be funded under Nirbhaya Fund for implementation from the financial year 2015-16. The Union Minister of Women and Child Development has taken a review meeting on the proposals of Emergency Response System of Ministry of Home Affairs on 6.4.2015 and on the project of Ministry of Road Transport & Highways “Security for Women in public road transport in the country” on 15.04.2015. (iv) The lifetime and last one year use of opium was higher in the children living on the street than in children living at home. The Ministry of Women and Child Development is implementing a Centrally Sponsored Scheme, namely, Integrated Child Protection Scheme (ICPS) from 2009-10 for children in difficult circumstances including children who are victims of substance abuse. Under ICPS, financial assistance is provided to State Governments/UT Administrations, inter-alia, for setting up and maintenance of various types of Homes, including, Shelter Homes, Open shelters etc. These Homes provide inter-alia, shelter, food, education, medical attention, vocational training, counseling, detoxification and treatment etc. to such children so that they can ultimately reintegrate into the mainstream society. ICPS also provides Specialised Services for Children with Special Needs including children affected by substance abuse. These services cater to individual specific needs like substance abuse, behavioural problems and social deviant behaviours and require specialized institutional care and treatment including medical, nutritional, and psychological support. Each State/UT has to notify and designate at least one shelter home for care, detoxification and counseling of children affected by substance abuse. These Shelter Homes shall offer day and night shelter facilities to the children in need of support services for a temporary period, while efforts are made to rehabilitate them. Further, the Ministry of Social Justice and Empowerment implements Central Sector Scheme of Assistance for Prevention of Alcoholism and Substance (Drugs) Abuse under which financial assistance is provided to NGOs /Voluntary organizations for running Integrated Rehabilitation Centres for Addicts (IRCAs), organizing de-addiction camps and conducting awareness programmes about the ill effects of Alcoholism and Substance (Drugs) Abuse on the individual. Family, workplace and the society at large. The IRCAs (de-addiction centres) provides counselling, treatment, after care and rehabilitation of drug dependent persons including children. (i) International Day against Drug Abuse & Illicit Trafficking is observed on 26th June each year. As part of this programme, rallies, paintings campaign, workshops, seminars etc are organized at the National as well as State level. On this occasion, National Awards for outstanding services in the field of Prevention of Alcoholism and Substance (Drugs) Abuse are conferred to the Individuals and Institutions to encourage them and recognize their efforts. (ii) The National Institute for Social Defence, an Autonomous Organization under the Ministry of Social Justice and Empowerment in collaboration with Regional Resource and Training Centres and other collaborating partners organizes sensitization programmes in Schools/Colleges and skill development programmes in the field of social defence including counselling and drug de-addiction. an awareness generation programmes in some districts of Punjab and Manipur through Nehru Yuva Kendra Sangathan (NYKS), an Autonomous Organization under the Ministry of Youth Affairs. In October 2014, the Ministry has again assigned the task of awareness generation in Punjab to cover all districts to NYKS. The Ministry of Women and Child Development (MWCD) has invited applications from organizations/ NGOs as per revised guidelines of Support to Training and Employment Programme for Women (STEP) Scheme. The guidelines were revised in December 2014. The Ministry has been administering ‘Support to Training and Employment Programme for Women (STEP) Scheme’ since 1986-87 as a ‘Central Sector Scheme’. The STEP Scheme aims to provide skills that give employability to women and to provide competencies and skill that enable women to become self-employed/ entrepreneurs. The Scheme is intended to benefit women who are in the age group of 16 years and above across the country including rural women. The grant-in-aid under the Scheme is given to institutions/ organizations including NGOs. The assistance under STEP Scheme will be available in any sector for imparting skills related to employability and entrepreneurship, including but not limited to the Agriculture, Horticulture, Food Processing, Handlooms, Tailoring, Stitching, Embroidery, Zari etc, Handicrafts, Computer & IT enable services along with soft skills and skills for the work place such as spoken English, Gems & Jewellery, Travel & Tourism, Hospitality. The proposals under STEP are considered as per the scheme guidelines. For proposals of organizations from North Eastern States, verification of credentials is got done through Ministry of Home Affairs before release of funds. The guidelines of STEP Scheme have been revised in December, 2014 by Ministry of Women and Child Development. In addition, other sector specific Ministries and State Governments have skill development programmes of their own. For proper implementation of the scheme, the guidelines envisage concurrent monitoring/evaluation of the projects funded under the scheme.